Mystic David Hoffmeister uses Quantum Physics and 7 mind-expanding movies as modern-day parables to guide you into an experience of Quantum Forgiveness! and strengthening your miracle mindset!" Check out our amazing Winter Sale! Why use movies in a book? Take forgiveness as taught by Jesus 2,000 years ago, the science of the material universe as understood by Quantum Physics, and movie-watching as a spiritual tool. Combine that with the clarity of mystic David Hoffmeister, a world-renowned teacher of A Course in Miracles, and you have an insightful and original book for Awakening to permanent Peace. SHARE: Click here to share Quantum Forgiveness on your social media! —Raj Miles, Editor of Elohim Magazine after traveling with David Hoffmeister for two weeks. QUANTUM FORGIVENESS The practical implications of Quantum Forgiveness are immense! Using seven modern-day movies as teaching examples, David Hoffmeister guides us through time and space to a Holy Instant that ends pain and suffering. If we open to what this book has to share and apply it in our daily life, we need never again fear being wrong, strive to create a better life, or compromise ourselves by trying to adapt to a false idea of who we are or what the world is. Instead, we will relinquish expectations and come into a limitless sense of pure potential without concern or criticism. Clueless and cared for, we will experience the true nature of Reality and flow through our world as a happy dreamer—relieved of false responsibility, yet still truly helpful! You need not enjoy movie-watching to receive the profound gift of this book. The text is a complete teaching in and of itself, offering a portal of awakening for any open mind. Solaris (2002), Source Code (2011), Mr. Nobody (2009), Frequency (2000), X-Men: Days of Future Past (2014) Next (2007) and Star Trek: Deep Space Nine, Episode “Emissary” (1993). Why wait for the drama to play out in your life, when you can let the character on the screen do it for you? If you would like to watch the movie as part of the healing experience, we recommend the following steps. 1) Read the corresponding chapter before you watch the movie. This will help you prepare your mind to see the symbols and characters of the movie as “pointers” to the truth. The chapters provide a discussion that goes deeply into the lessons of the movie, offering clarity and solidifying the healing benefits in the mind. 2) Watch the movie. Be willing to stop the movie in order to detach from intense scenes, attractive scenarios, or moments when you want to know what will happen next. Watch your emotions and the investment you have in the images. Even if you experience discomfort, try not to distract away from it. Give yourself permission to stop investigating and just be with what is arising in awareness. 3) Reread the chapter and rewatch the movie until you feel you have moved from an intellectual understanding to an actual experience of the Truth. Ask Spirit to guide the direction of your thinking while you are reading and watching. Enjoy waking up with the movies! Check out our online Movie Watcher's Guide to Enlightenment! THE EXPERIENCE David’s practical application of these non-dual teachings necessary to experience the Unified Mind and his clarity about the function of True Forgiveness in spiritual awakening, allow us to accept Rumi’s invitation into a field of pure potential! The mystical experience is one of clarity, great joy, deep peace, and tranquility—it ends the world of duality and conflict forever. The experience is not of this world, but radiates from within. It is not a concept; it comes into awareness when all concepts have been laid by. DAVID'S BIO Mystic David Hoffmeister is a living demonstration that peace is possible. His gentle demeanor and articulate, non-compromising expression are a gift to all. He is known for his practical application of the non-dual teachings necessary to experience the Unified Mind. His clarity about the function of forgiveness in spiritual awakening and his radical use of mindful movie-watching in the release of judgment is unsurpassed. The purity of the message he shares points directly to the Source. Over the past 29 years, David has traveled to 41 countries across 6 continents to extend the message that Truth is available for everyone, now. David’s message speaks to all people, regardless of whether their background is religious, spiritual, or scientific. He is as comfortable delving into the metaphysics of the movie The Matrix, as he is in pointing to the underlying meaning of the scriptures in the Bible. David’s own journey involved the study of many pathways, culminating in a deeply committed practical application of A Course in Miracles, of which he is a renowned teacher. His teachings have been translated into 13 languages, and taken into the hearts and minds of millions through the intimate style of his books, audios, and videos. We always make the best decision we can based upon what we believe in that moment. When I was growing up, my father and I experienced a lot of tension with each other for many years. He had bipolar disorder and it was very difficult for him. As I got older and went through my transformation of consciousness and really forgave him—and forgave myself and forgave the world—my father started showing up in my awareness as an angel. He got happier and happier and our relationship began to improve. He lit up when I said this. His whole demeanor changed and he instantly reflected love back to me. That simple exchange completely rearranged our view of everything that had taken place during those early years. None of it mattered anymore. We had been mistaken about many things because we couldn’t perceive truly while we were going through our time together. All that had really been happening was that I had tried to hold him to the “father role,” and he had tried to hold me to the “son role.” This created a wrestling match that led to untrue beliefs like, “You should be a better father,” and “You should be a better son.” We had been mistaken about many things. When we finally let go, he was no longer my father, and I was no longer his son. We recognized our perfect equality in that moment, and only the love was left. We laughed and hugged each other. We shared an intense joy together. The war was over. From that instant on, we were happy when we were together, right up to the point when he passed away. "I am very excited about Quantum Forgiveness. The pioneers of quantum physics overturned and transcended Newtonian physics and the scientific method. Quantum physicists worked down to the smallest units and realized that everything they thought they knew about the world was not true. The world is about potentiality. In superposition, for example, things appear where we believe they will appear. And that is exciting because it is a science discovery that does not have to stay in the lab. It actually has everything to do with who we are. It is the gateway to our experience of being one with Source!" "In this world we like to follow the plot, to think we know what is happening, what is coming next. But these great quantum movies are like spiritual experiences. They start to dismantle the world as we know it, and we find ourselves knowing less and less about what is happening. We do not have to know; there is a Presence behind all this that knows what It is doing. Instead of feeling nervous when things start to dismantle and fall apart, we can accept that we personally do not know, and see it as a good thing." “The Course is perplexing for many because it dismantles every aspect of linear thinking. Those who try to maintain the linear perspective—that is, the story of their lives, their self-concept—will resist learning the Course because it leaves only the Present Moment, which is the gateway to Eternity." "A thrilling, fantastic deep-dive on how to use film to facilitate the celestial speed-up." "I found it difficult to put this book down! David has a wonderful ability to draw detailed meaning from the movies and apply it to examples from everyday life. His cut-to-the- chase depictions of authentic forgiveness and the ego's thought system are some of the most helpful I have ever read!" "Since the dawn of time, myths, stories and parables have been used by spiritual teachers to reveal spiritual truths. Many popular movies speak not only to our desire for entertainment, but also to the universal human need to understand the mysteries of the universe. 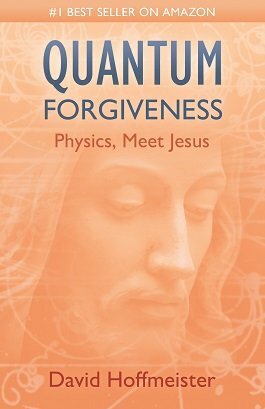 In Quantum Forgiveness: Physics, Meet Jesus, David Hoffmeister uses movies as contemporary parables, making modern spirituality personal and relevant."